Well here it is! 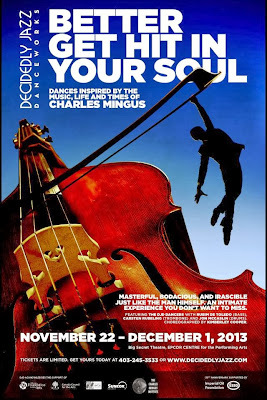 The last two and a half weeks have been busy, busy, busy rehearsing with Calgary's Decidedly Jazz Danceworks company, putting together the pieces for Kimberly Cooper's latest creation: "Better Get Hit in Your Soul: Dances Inspired by The Music, Life and Times of Charles Mingus". 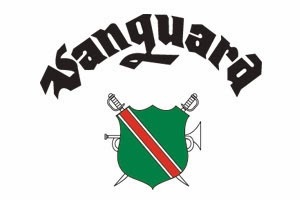 The show features a cast of seven very talented dancers with a three piece band (with yours truly on drums) and the production uses music that spans over the course of Mingus' career including pieces such as "Haitian Fight Song", "Tonight at Noon", "Goodbye Porkpie Hat" and selections from his epic through-composed compositions "Epitaph" and "The Black Saint and The Sinner Lady" among others. Cooper has done a masterful job of choreographing some very challenging movement to Mingus' music while at the same time capturing the spirit and depths of his giant personality. The dancers are rising to the challenge every night and raising the bar for all of us. It's very exciting to be a part of such a creative project like this, done at such a high level. I like to think that Mingus would have been impressed and enjoyed what Kim has done with his music. It's also been a great opportunity for me to get deeper inside the music of Mingus and, in particular, the drumming of Dannie Richmond (who's contributions are very underrated in my opinion...). To say I've been getting a workout on my uptempos and fast 3/4 grooves would be an understatement! Here's a taste of the show! "The first prerequisite for listening to music is so obvious that it almost seems ludicrous to mention, yet it is often the single element that is absent: to pay attention and to give the music your concentrated effort as an active listener. It is revealing to compare the actions of theater audiences to those of symphonic audiences. In the theater the audience listens with full attention to every line of the play, knowing that if important lines are missed understanding can be diminished-this instinctive attention is too often lacking in the concert hall. One has but to observe listeners at a concert to witness the distractions of talking or reading or simply staring into space. 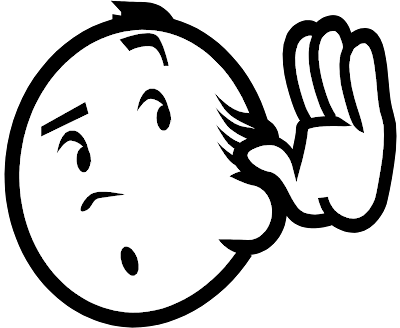 Only a small percentage are vitally concerned with the essential role of active listening. This lack is serious because the listener is essential to the process of music; music after all consists of the composer, the performer and the listener. Each of these three elements should be present in the most ideal way. We expect a fine composition brilliantly performed, but how often do we think it should also be brilliantly heard? The destiny of a piece of music, while basically in the hands of the composer and performer, also depends on the attitude and ability of the listener. It is the listener in the larger sense who dictates the ultimate acceptance or rejection of the composition and performer...Unfortunately for music, many listeners are content to sit in an emotional bath and limit their reaction to music to the sensual element of being surrounded by sounds. But the sounds are organized; the sounds have intellectual as well as emotional appeal. The adventure of learning how to listen to music is one of the great joys of exposure to this art...Your efforts to understand more of what is taking place will be rewarded a thousand-fold in the intense pleasure and increased interest you will find." Just a brief one today....I'm on the run these days rehearsing like mad with Calgary's Decidedly Jazz Danceworks upcoming production featuring the music of Charles Mingus. My first introduction to rudimental snare drumming was via my drumline training days while growing up, playing music in the Regina Lions Band (1986-1995). In fact, the very reason I learned to play traditional grip initially came from the fact that if I wanted to crack the top snare line, traditional grip was an absolute must! While my journey as a musician has taken me far from the fields of competitive marching bands and drumline warmups in empty parking lots, I still really value the foundation that learning my rudiments has created for me. In all honesty, I kind of "forgot" about the rudiments for awhile during my early 20s while I focused on other drum set things. But after studying with the likes of Dave Laing, Kenny Washington and learning about Alan Dawson's "Rudimental Ritual" and Charlie Wilcoxin's "Rudimental Swing Solos" (and not to mention Philly Joe Jone's awesome application of the rudiments) things have really come full circle for me with regards to dealing with rudimental snare drumming and using these patterns in a practical and musical way. The name Frank Arsenault is also mentioned in this series. 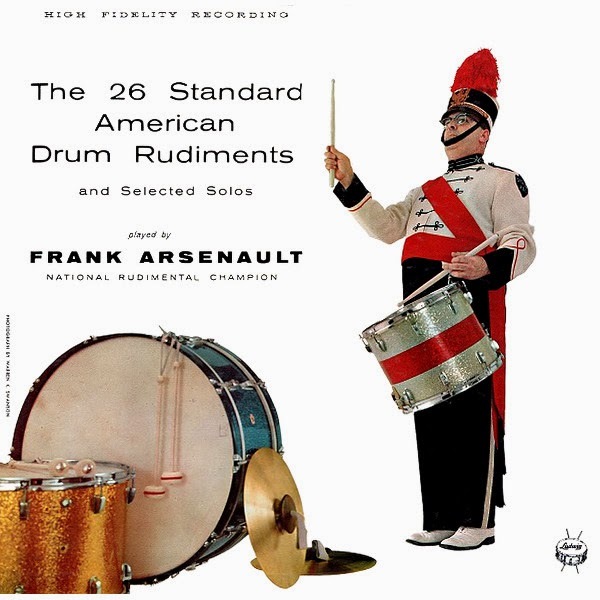 Arsenault was an incredible, championship snare drummer and an important pioneer in terms of teaching rudimental drumming. 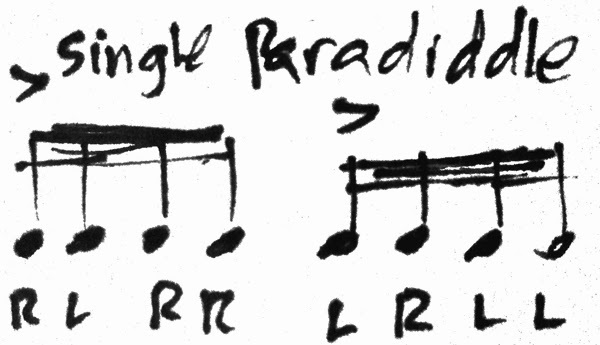 So don't forget to learn your rudiments. They are like the "wheaties" of jazz drumming. They are good for you! I was going to post this on Monday but since it was Remembrance Day I decided to wait until today. I hope you all had a nice long weekend and for those of you who had a day off that you all took some time to remember the sacrifices so many have made for the greater good. - Canadian Jazz drummer Ted Warren has long been a huge influence on me. His creativity, dedication and mastery of the drums is astounding. There are very few people that I know of that have put in the time that Ted has on his instrument. I moved to Calgary shortly before Morgan moved to Toronto in 2009 but I've always been a fan of his drumming and swinging beat. Now THAT'S some serious rhythm to deal with! All right. That's all I've got today. Have a great week and see you soon! "In Africa they say there is no rhythm without its accompanying dance, that the rhythm of the dancing body complements the rhythm of the music, and to separate the two is to understand nothing." A drummer/percussionist e-mailed quite awhile ago with some questions about how to approach playing drums and percussion for contemporary dance classes. Over the years I've done this quite a bit and thought I would share a few ideas on this subject. Now I had always been fascinated with the overall relationship between dancing and drumming and considered it to be pretty significant but it wasn't until I started playing with dancers on a regular basis that this all took on a deeper meaning for me. These days I only do this sort of thing occasionally (like once or twice a semester) but a few years ago I did this as a full-time job for a full year at the University of Calgary and it was an incredible experience for me. Lately I've been working with Calgary's Decidedly Jazz Danceworks company but the context is slightly different than playing for contemporary dance classes at the university. I found playing drums and percussion for contemporary dance classes to be a lot of fun and incredibly fulfilling. It definitely improved my overall drumming, my sensibility to rhythm and made me a better musician. -I had never played hand drums before I took the dance accompanist gig at the UofC in 2006 so I had to develop some concepts and hand drumming techniques pretty quickly (my background, of course, was a drum set one not as a hand drummer). I took a few quick conga and djembe lessons to get me started and develop some fundamental chops. -I later added a small 16” inch bass drum so my right foot could do something. -Sometimes I would step on on small tambourine as sort of a hi-hat with my left foot as well. I saw Jeff Ballard do this with Brad Mehldau's trio once and thought that was pretty slick...It's very effective. -My own personal musical background is mainly a jazz one but I also enjoy and play all styles of music/drumming. 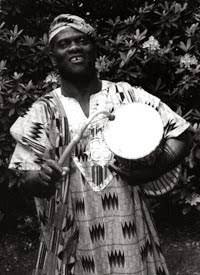 I’ve studied quite a bit of Afro-Cuban, Brazilian and West African Ghanian drumming over the years. Playing for these classes allowed me to draw from a wide range of rhythmic styles and traditions, blending them all together in a functional way. -Checking out the drumming and wide-open drumming concepts of Billy Martin, Trilok Gurtu, Matt Wilson, Jeff Ballard, Bob Moses, Dafnis Prieto and Glenn Kotche were also big inspirations for me and ideas for creativity. -I think of the dance routines that teachers come up with as being “compositions” and try to accompany them accordingly. -Subdivisions: It’s either going to be either in a duple or triplet subdivision and this will determine the feel. Usually you can tell by the way they move and/or count in the movement. -Time Signature: Is it in 4/4 or 3/4 or is it something else? -Form: The movement routine will also always follow a number of bars and not necessarily in 4 or 8 bar phrases either! If you can “set-up” the beginning of each new section, the dancers will love you. Think of the dance routine as a “tune” and you are set. -Taking all of those principles into account, when I’m playing patterns I always try to create a sort of melodic line between the high and low drums to give it a sense of direction and musicality. You might want to try this just with a single djembe or conga at first by exploring the dynamic between the low and high tones. Check out some of the great Cuban congueros and you’ll know what I mean by this. Having said this though, I personally never seem to play any kind of “authentic” patterns when doing these kind of gigs....I just find some interesting rhythms that work and go with it! Perhaps try to repeat whatever pattern you come up with as well to give it some continuity then add the occasional variation or embellishment. Always go for the groove and you can never go wrong. Here's a couple of clips of a GREAT dance drummer who definitely has some cool things going on! 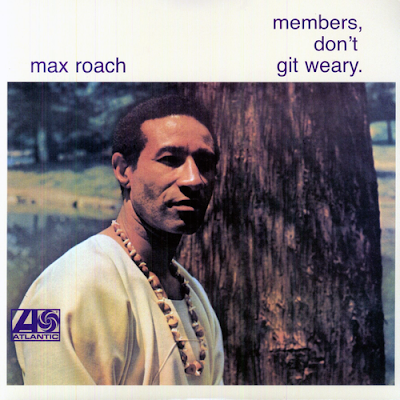 Thanks to Curtis Nowosad for hipping me to this great interview with Max Roach via the Facebook. This is from the January 1979 issue of Modern Drummer. 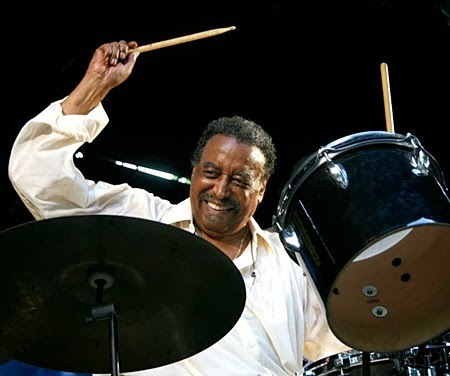 HH: Along with Kenny Clarke, you were a founder of the bop style, changing the rhythmic emphasis from the bass and snare drum to the ride cymbal, using the other components for accents and color. There are those who say that Kenny was primarily responsible for this transition and that you carried it further. Is that how you see it? MR: Kenny's influence was that you should get more involved in harmonic playing. Kenny plays piano and is a total percussionist. It had little to do with the technique of playing. Kenny was in the Army when I came on the scene. I knew nothing about him until after recording with Coleman Hawkins. That style of playing was already established around New York. The first person I heard on radio who played broken rhythms using the bass drum and hi-hat was Jo Jones. Actually, Chick Webb, Jo Jones, O'Neil Spencer, and Sidney Catlett had the greatest influence on me. 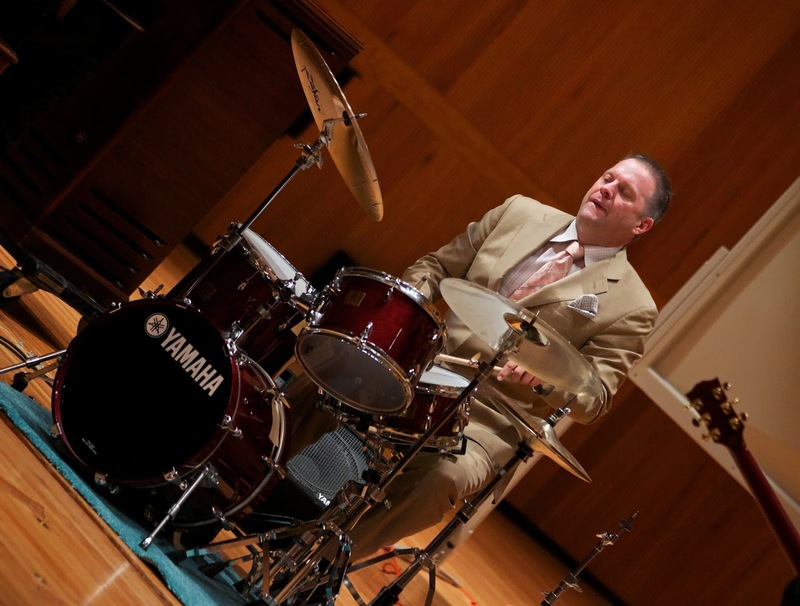 HH: How do you view the drummer's role as an accompanist and timekeeper? MR: Drummers are required to support constantly. We're expected to be the rhythmic foundation. 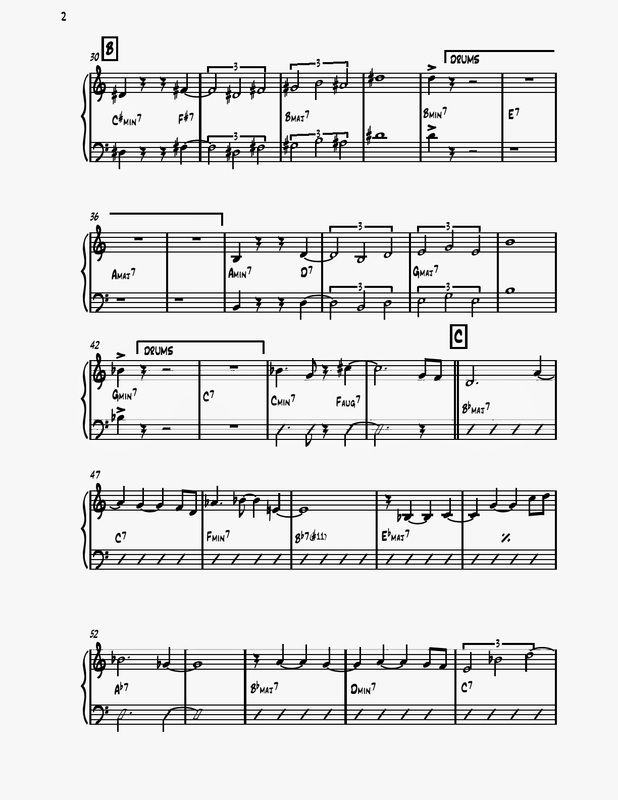 One thing I gloried in, working with people like Charlie Parker, was the built-in rhythm section. You didn't need a drummer or a bass player to know where the time was. If you don't lay the beat down for some players there's no form or rhythm in their playing. You're almost like a slave. "Bam bam bam bam" or "Boom bam de-boom-boom bam," whatever it is. I think the instrument goes beyond that. Most percussionists spend a lot of time developing themselves on the instrument. A lot of things we do never have a chance to come out. When the moment comes where the band finally turns around and says, "Okay, you got it," most of the time you overdo it. Excluding a wind instrument, there's always the danger of sounding inhuman. You're not obliged to take a breath before you do something. Wind instrumentalists are obliged to be human; they have periods, question marks, exclamation marks, phrases. But there's always the danger, with people who play piano, percussion, or string instruments, of not creating phrases that speak out to people. You can just rattle for hours. That characteristic is not only unmusical, but unnatural as well. Someone asked me about the use of the metronome and I answered that you should use it only if you cannot keep time and are trying to develop a sense of holding time at a certain level. But to play metronomic time is another inhuman aspect. The time should be at the same place, but to make it elastic sounding, it may have to get a little faster or slower. A metronome locks you into "bap bap bap bap." With my quartet, holding time for each other would lock us in. My charge with the group is to add color and be dynamic in my accompaniment, not just to keep time for the players. They keep time. I can go outside of the time. We sometimes deal with sounds that have nothing to do with the meter, just for an effect. Everyone should have that time. HH: How do you approach solo improvisation? MR: When I go into an improvisational section it is not preplanned. I have all the techniques at my disposal. When someone else stops, I'm permitted to deal with my thoughts on a particular musical subject. I come to it free. The first thing I throw down into the instrument will determine the pattern and its development. Within, I'm conscious of what I call conversational structure, saying something to myself and answering. I try not to do things because I can do them. I try to allow the moment to create itself, to respect silence, to say something and let the audience absorb it. HH: Many of your solos use brief melodic, rhythmic refrains, usually accompanied by bass drum, hi-hat vamps. 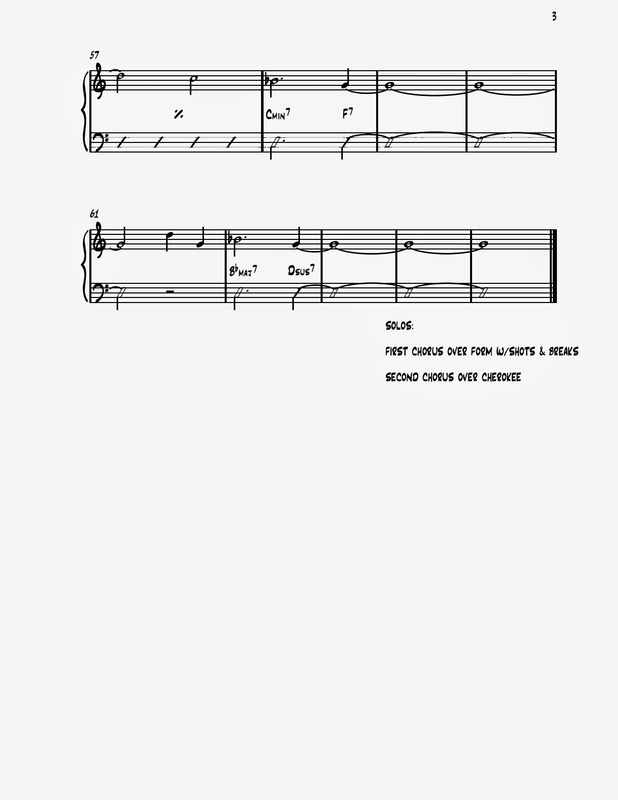 These figures unify and contrast the improvised sections--kind of a loose rondo form. Do you feel that this technique is something in which you particularly are an innovator? MR: Yes, maybe so. During an evening, week, or month of performing I play a host of drum solos. To live with myself I have to constantly set up new things, and interest the members of the group. We all have to do this. The rule is not that you killed them last night--you know what will bring the audience to their feet. That's not the rule for the creative musician. You should try each night to introduce something that you didn't do the night before. It's always a challenge, for Billy or Cecil or Calvin or whoever, to do something that wasn't done before. The public may not be aware of that, but for us it means we're developing ideas for new recordings, for new pieces. I do set up a call and response thing, something to return to that's still within the structure of the piece. Music to me isn't merely a matter of being melodic and harmonic. When you deal with the essence of art, it has more to do with design. If it doesn't have some kind of design, then it doesn't make sense to me, which is why I appreciate Monk and Bartok. HH: Are hand positions and wrist action something to which you've devoted a lot of attention? MR: Wasted motion. That is what was different in the rudimental approach to the instrument from the way we viewed it. On 52nd Street everything was close to the instrument because you played exceptionally fast. You had to play at a certain volume, so you didn't raise your hands high. You had to play what was acoustically best suited for small clubs. HH: What about your brush technique? You're constantly flipping the left hand over, creating a continuous swishing triplet sound. How did you develop this? MR: I learned the law of playing brushes from O'Neil Spencer and Big Sid Catlett. The brush is really not supposed to leave the drum. You're supposed to create a sweeping effect to get the accents without picking the brush up off the drum. HH: In 1961 you said, "I will never again play anything that does not have social significance." Today, as you return to full-time performing, how do you feel about that statement? MR: Well, I'm still at the same place, and I'll tell you why. There are those who think that art is for the sake of art, but actually it never is. Art is a powerful weapon that society, or the powers that be, use to control or direct the way people think. Culture is used to perpetuate the status quo of a society. Even though I'm involved in music for the sake of entertainment, I always hope to offer some kind of enlightenment. The Drummer as Composer Part Three: "Finding Farnsworth"
In today's instalment of my occasional column "The Drummer as Composer", I'd like to share a tune I wrote around the year 2002 entitled "Finding Farnsworth". 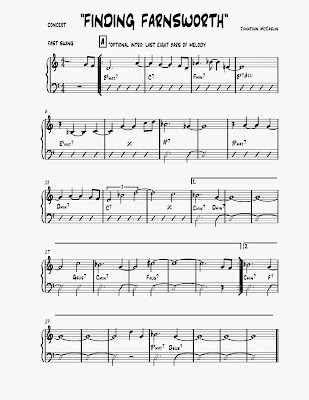 This piece appears on my first album "McCallum's Island". 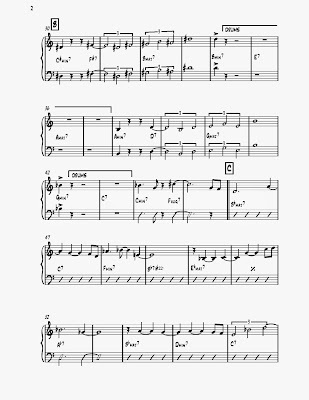 Around the time I first wrote this piece I had just started checking out the drumming of Joe Farnsworth and was really impressed with his hard-swinging style with such artists as Benny Golson, Mike LeDonne, Eric Alexander, One for All, George Coleman, Harold Mabern, David Hazeltine and many others. I wanted to write a fast, up-tempo tune as a drum feature with the drumming of Mr. Farnsworth in mind and came up with this one, loosely based on the changes to "Cherokee". Well, it is essentially the changes of "Cherokee" (!) 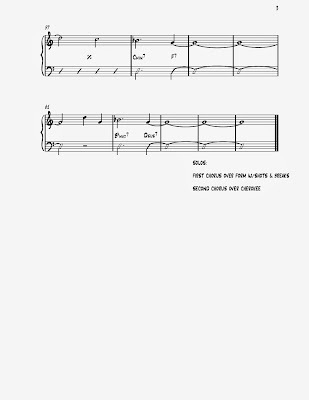 with my own melodic line written over top however I changed a few chords to adjust for the melody and also you'll notice that the phrasing of the melody itself stretches in the first and second endings of the 'A' sections as well. The bridge is meant to imply either a half-time swing or Afro-Cuban 12/8 feel with the bass doubling the melody (rather than walking throughout). There are also drum breaks throughout the bridge and the end of the 'A' sections. It is also meant to be played as fast as humanly possible! If I can figure out a way to embed the recording of this one I will! It's a really fun tune to unleash and stretch on. I'm going to make a point of revisiting this one with my current band in the near future. 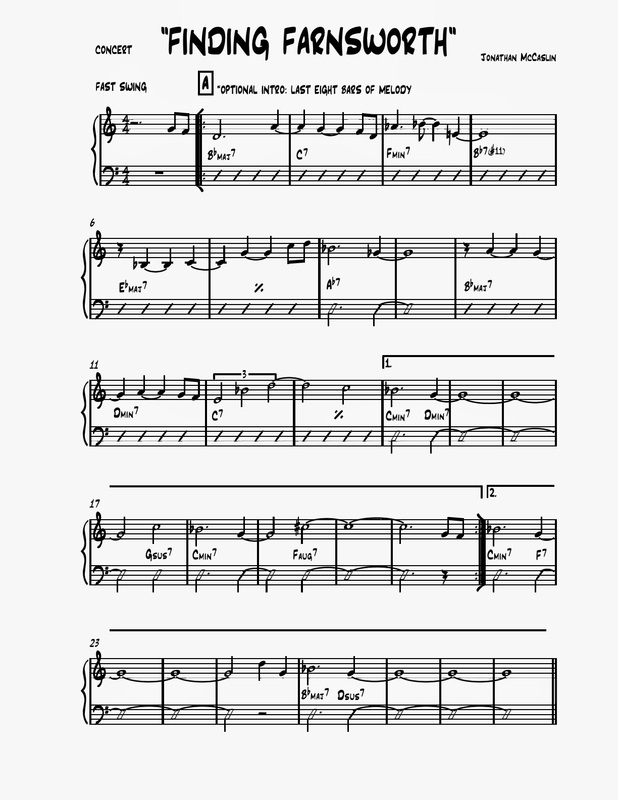 If you are interested in checking the original recording of this tune, my album "McCallum's Island" (originally released in 2003) will soon be available on cdbaby.com or my in-the-works-coming-soon website. Thanks to Jeff Cosgrove who first suggested that I post and share my music here on my blog. Eventually I'll have all my charts from my first two albums (and other unrecorded tunes of mine) available in a sort of compilation "McCaslin Fake Book". solos series 1: Jazz from Robinson Films on Vimeo. Joe Farnsworth "Spirit of Japan" from Robinson Films on Vimeo.